Sisi is eager for international endorsement. European leaders should withhold it. Voting in Egypt’s presidential election is still under way but the outcome is not in doubt. In the run-up to the poll, President Abdel Fattah el-Sisi has engaged in a carefully choreographed set of moves designed to prevent any serious candidate from running against him while preserving the illusion of a competitive race. Several credible candidates who attempted to run were blocked through arrest or intimidation, including two former senior military officials. At the last minute, an obscure politician who had earlier declared his support for Sisi was drafted in to provide some token opposition. Sisi has led Egypt since he seized power in July 2013, and was elected as president in May 2014. Under his leadership, the country has been subjected to a regime of repression that is harsher than under President Hosni Mubarak before the 2011 uprising. Tens of thousands of people have been imprisoned for political offences, tight controls have been imposed on the press and civil society, and the security services routinely use torture and, increasingly, enforced disappearance. Sisi’s vision for the country allows no space for political opposition or expressions of public dissatisfaction, an approach that is clearly visible in the charade of these elections. Egypt engages with the EU because of its own interests and will not withhold its cooperation if European leaders adopt a degree of critical distance from the Egyptian regime. Since Sisi became president, European leaders have gradually come to accept him as someone they must do business with. This reflects Egypt’s perceived importance as a partner on issues such as terrorism and migration, its influence in the region (notably in Libya), and the commercial opportunities it offers. Many officials in the European Union are willing to admit in private that they believe Sisi’s policies do not offer a prospect of genuine stability and are likely to prove counter-productive in the long run. 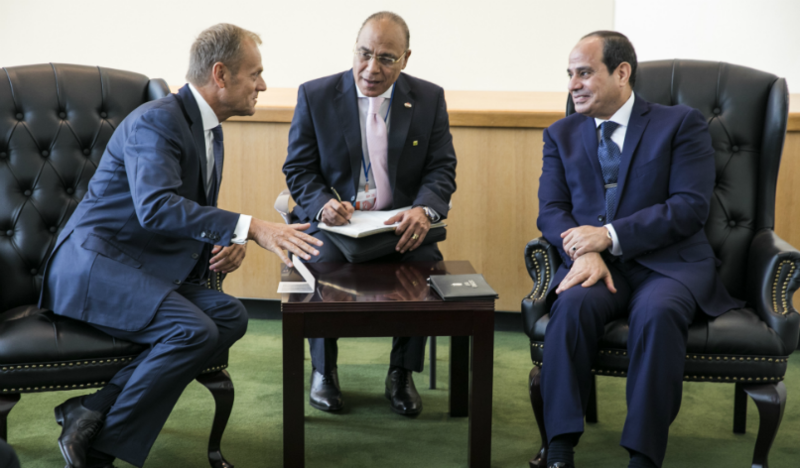 Nevertheless, Europeans tend to feel that outspoken criticism of Sisi would not have any positive effect and would jeopardise the EU’s relations with Egypt. But cooperative relations with Egypt do not require the EU to adopt an uncritical stance. There is a difference between working with Sisi as a partner and endorsing him as a democratic leader – and these elections offer a significant opportunity for European leaders to make this distinction clear. Egypt engages with the EU because of its own interests and will not withhold its cooperation if European leaders adopt a degree of critical distance from the Egyptian regime. Moreover, the course of this election campaign suggests this may be a particularly important moment for European leaders to show that they do not buy in to the picture that Egypt’s leader is at pains to present. Most Egyptian analysts agree that Sisi’s hold on power is reasonably secure. He appears to retain a significant degree of public support, based on the idea that he stands between Egypt and chaos, and there have been few signs of large-scale opposition to him within Egypt’s elite. Nevertheless, some of Sisi’s recent actions have displayed signs of insecurity or, as some observers describe it, paranoia. In the last few months, Sisi removed both the army chief of staff Mahmoud Hegazy and the head of the General Intelligence Directorate, Khaled Fawzy. The reason for his actions remains unclear, but they provoked speculation that sections of the security services may be unhappy with Sisi’s leadership. The decisions of the former air force general Ahmed Shafiq and former military chief Sami Anan to run for the presidency also suggests that they may be aware of dissatisfaction among their former colleagues, even if Sisi was able to easily deflect their campaigns. Shafiq and Anan are no one’s idea of liberals, but it is notable that in launching their campaigns both of them suggested that Sisi’s repression had gone too far. Anan had promised to appoint a former anti-corruption official as vice-president for human rights. Shafiq told supporters that “a true democracy and basic human rights are not a given”, though he put economic issues at the centre of his campaign. If these positions reflect broader concerns within the military and other parts of the elite about Sisi’s leadership, there could soon be a more decisive test of his support. There is widespread speculation that at some point after the election, Sisi may try to amend Egypt’s constitution to allow him to serve more than two terms, raising the prospect that he could retain power for many years. Against this background, European leaders would undercut the position of any opposition to Sisi if they appear to accept him as the legitimate winner of a meaningful election. The eagerness with which Sisi has consistently sought endorsement by international partners suggests that it has some value within Egyptian politics. For this reason, the advice to EU leaders should be the same as that reportedly written in capital letters by Donald Trump’s advisers before his post-election phone call with Vladimir Putin (and ignored by the US president): Do not congratulate! European leaders should treat the Egyptian election as the meaningless exercise it is. And as Sisi embarks on his second term, they should make a renewed effort to find a way in their dealings with him to suggest that they disagree with his approach to the governance of Egypt, even while they work together on areas of mutual interest.